Prices INCLUDE all taxes and fees! No hidden surprises. We can build any combo fish, sightseeing and overnight trips for a full boat (6 people). Contact us today and let us help you build the corporate retreat, family trip or Alaskan fishing trip that is perfect for your group. During the early season we concentrate on halibut and rockfish such as ling cod, yellow-eye and black bass fishing. All of these fish are exceptional eating and prized by fishermen. The rockfish are a great sport fish for lighter tackle and can be caught on bait or with artificial lures. We traditionally fish further out for halibut and rockfish and are always surrounded by Alaska's breathtaking scenery. Seward Alaska's most well known asset is it's exceptional silver salmon fishing. Each year thousands of anglers come to Seward to fish on charter vessels, small boats, and even from shore. As August arrives there are silvers literally jumping right in the boat harbor. As the season progresses, the Silvers move up the bay and get closer to the spawning streams. 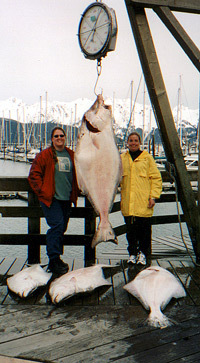 Quite often you may be fishing within sight of Seward or even along the waterfront area of town. We accept VISA, Mastercard, Discover, AMEX.